“There are really two parts of what we do,” Rev. Newman said. “The first is preparedness, helping people to know what to do, in advance. The second is what happens in response” to a storm or other disaster. For her, knowing what to do, ahead of time, is as important as knowing the steps to take after something has happened. 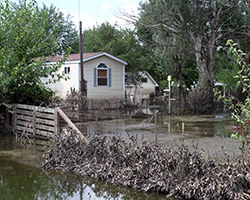 The Disaster Preparedness and Response ministries help people learn what to get in place. Such things as having a list of medications, telephone numbers of people to contact, a flashlight, weather radio, and the whereabouts of important papers is vital. Having a designated place to go preset when a storm warning is issued helps to “give a little control in the midst of chaos and anxiety.” Cards with key checklists “have been distributed at past Annual Conferences” and will be again. “In Iowa,” Rev. Newman noted, “people help neighbors. Sometimes, even, the response of people reaching out to each other is so great that our ERT’s aren’t needed!” While ERT’s might not be needed to saw tree limbs or pump water or clean basements, initially, they do provide an additional vital response – spiritual care. “We are a church family,” she noted, “and will be there for one another, walking side-by-side, helping to ‘just be’ with one another and reminding that God is present, loving and caring, no matter what.” While it’s often hard to focus in a crisis, the ERT’s are a “prayerful presence,” calling on God for strength. Rev. Newman recalled what happened during the disaster that struck Mapleton, Iowa. 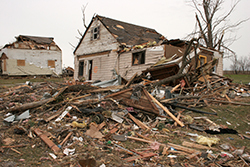 An EF3 strength tornado devastated the western part of Mapleton at about 7:30 pm on April 9, 2011. Some reports indicated that more than half the town was damaged or destroyed. People heeded the early warnings and took shelter. Shortly after the tornado it got dark. First responders searched for survivors and made an initial damage assessment.